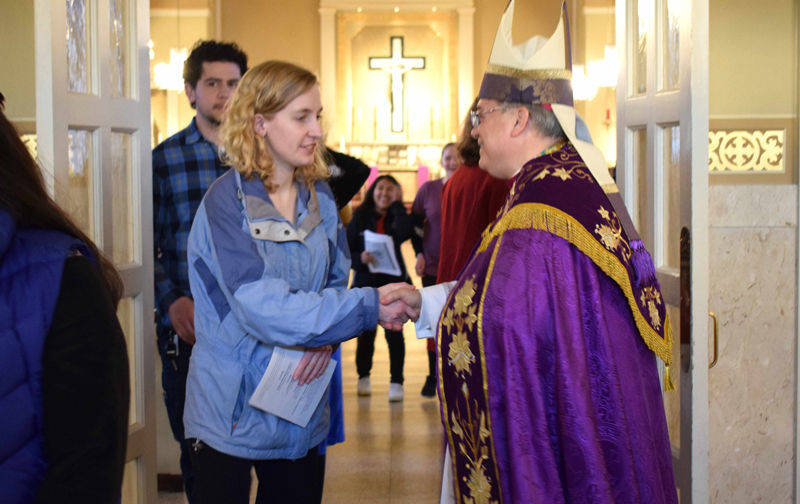 “I’m grateful to be with you this evening on Laetare Sunday – even in Lent, the Church calls us to rejoice, Easter is near,” Bishop Alfred Schlert told young adults during “Vespers with the Bishop” March 31 at Holy Guardian Angels, Reading. Young adults ages 18 to 35 were invited to a solemn vespers with the Bishop during the evening sponsored by the Diocesan Office of Youth, Young Adult and Family Ministry (OYYAFM). Assisting Bishop Schlert were Father Robert Finlan, pastor of Holy Guardian Angels; and Father Mark Searles, director of the Diocesan Office for Vocations Promotion and chaplain of Allentown Central Catholic High School. Providing music during vespers were cantor and organist Kolbe Eidle, younger brother of seminarian Keaton Eidle; and Franciscan Sister Martha Zammatore, liaison with the Diocesan Office of Prison Ministry, who alternated with Eidle on the organ. David Yingling, parishioner of St. Jane Frances de Chantal, Easton served as lector. Confessions were available after the service. Those attending included Mary Fran Hartigan, Diocesan Secretary of Catholic Life and Evangelization; Alexa Smith, director of OYYAFM; Father Stephan Isaac, assistant pastor of St. Ignatius Loyola, Sinking Spring and chaplain of Berks Catholic High School, Reading; and Rick Dooley, assistant director of the Diocesan Office of Adult Formation. A social followed at the parish for an opportunity to meet Bishop Schlert. 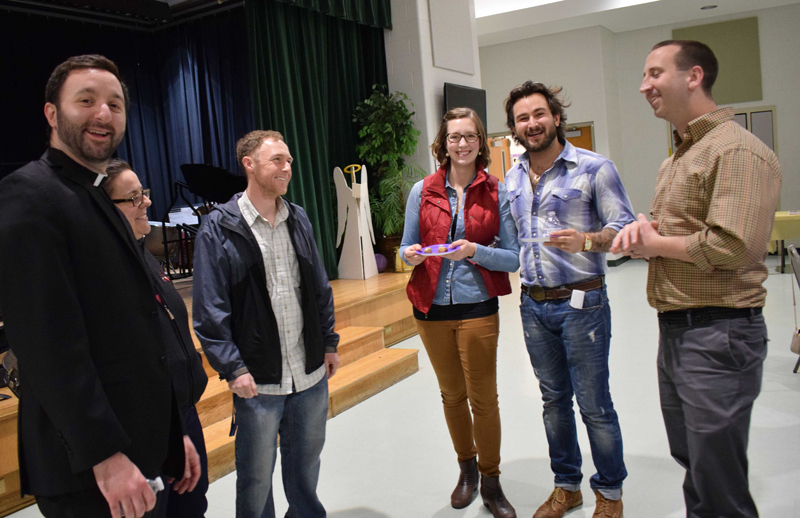 Alanna Boudreau provided music, and hors d’oeuvres by Boscov’s Catering were provided for noshing during the time of fellowship. “Even in our sinfulness, our Lord attends us, drawing us near,” Bishop Schlert said in his homily. The Bishop said Scripture and the teachings of the Church lead us to a joyfulness. The Bishop said loneliness can be part of the life of millennials, and this leads to seeking joys that are fleeting and passing to assuage that loneliness. “Tonight our rejoicing comes from the depths of faith, from knowing we have a loving father,” said Bishop Schlert. The Bishop said today’s world is increasingly cynical, and people are divided. The Bishop thanked Father Finlan for opening the parish to vespers, and to OYYAFM for organizing the event. Vespers, also called Evening Prayer, is part of the Liturgy of the Hours, also known as the Divine Office. In the Liturgy of the Hours, the Church fulfills Jesus’ command to “pray always” (Luke 18:1, 1 Thessalonians 5:17). Through this prayer, the people of God sanctify the day by continual praise of God and prayers of intercession for the needs of the world. The Liturgy of the Hours includes several specified times of prayer. The most important times, called the “hinge hours,” are Morning Prayer (which takes place upon the rising), and Evening Prayer (which takes place as dusk begins to fall). Bishops, priests, deacons and many men and women in consecrated life pray the Liturgy of the Hours each day. Their work is organized around this prayer, which orients their daily living of their vocations. Lay people are encouraged to pray the Liturgy of the Hours as well, especially Morning and Evening Prayer. 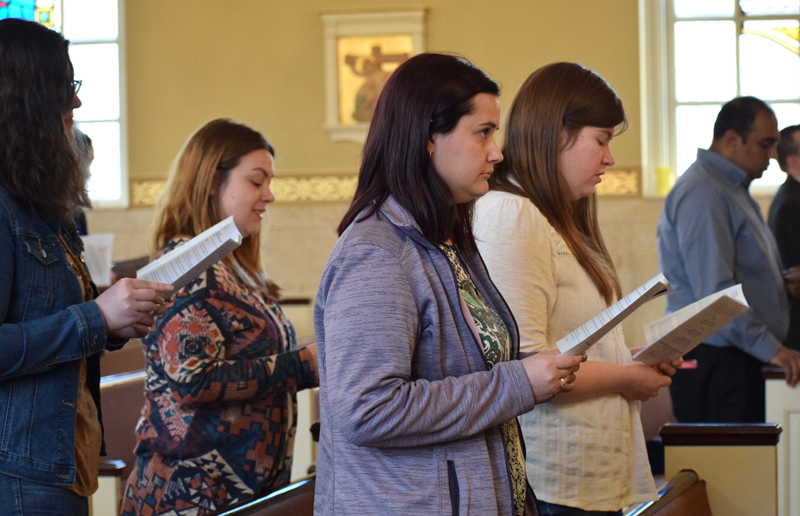 Many parishes in the United States schedule communal Morning and Evening Prayer on a regular basis. Evening Prayer gives thanks for the day just past and makes an evening sacrifice of praise to God (Psalm 141:1). Young adults raise their voices in song. 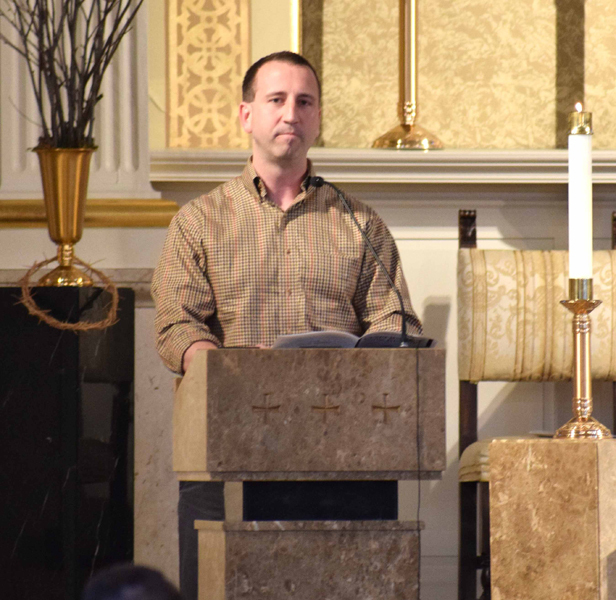 David Yingling, parishioner of St. Jane Frances de Chantal, Easton, serves as lector. Bishop Schlert greets Erin Trautmann, parishioner of St. Joseph the Worker, Orefield, after the service. Enjoying the social are, from left: Father Stephan Isaac; Ann Bartolacci and Steven Thomas, parishioners of St. Jane; Abby and Jim Maria, parishioners of St. Ignatius Loyola, Sinking Spring; and Yingling. Jim and Abby Maria are the son and daughter-in-law of Deacon John Maria, transitional deacon serving at the Cathedral of St. Catharine of Siena, Allentown. 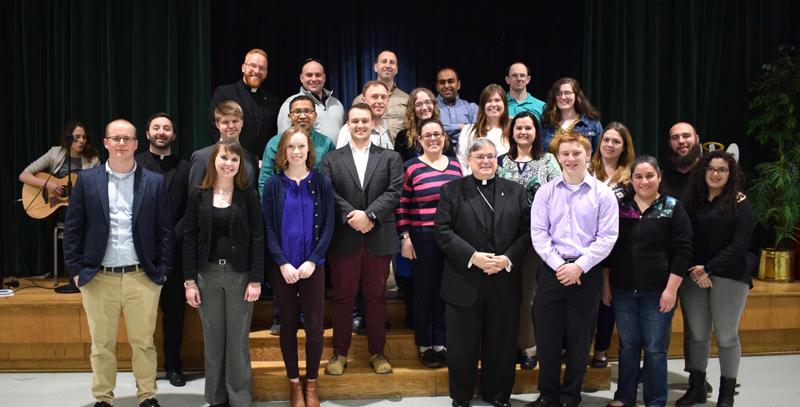 Bishop Schlert, center, gathers with young adults including: front second from left, Alexa Smith; middle left, Father Isaac and Rick Dooley; and back left, Father Mark Searles.